Manufacturer and exporter of filters for pharmaceutical, chemical and petrochemical industries. BASP Rotary Leaf Filter is particularly suitable for handling large liquid volumes with moderate to small but difficult to filter wet cakes, slimy sludges, Catalyst recovery etc. The filter stack rotates at high speed and discharges the wetcake.No manual cleaning. Wetcake drying is also possible. BASP Star Filter with Bag filter is most versatile, user-friendly & eco-friendly filtration system with unique self cleaning design, developed by BASP in early eighties, probably first time in the world. It is ideal replacement for Sparkler Filter. BASP Star Filter has vertical star filter element with flat surface having extended filtering area. Volume to Surface Ratio is high. 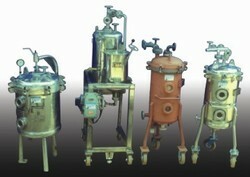 The filter is equipped with air/gas/steam sparger & water/solvent shower for cleaning the filter & filter media, in situ. The back bleeding of wash liquid with air helps thorough cleaning of filter media. Precoating and body feeding with Filter Aid can be done for effective removal of sub-micronic, sticky, gummy-suspenions/impurities. The modern Laboratory, be it Chemical, Pharmaceutical, Biotechnology or otherwise, to establish optimal process and to correctly select & size the Solid/Liquid separation equipment, The Scientist needs proper laboratory filtration system. 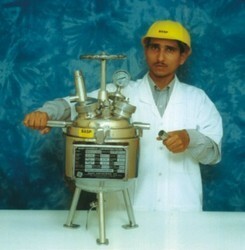 BASP has designed & built unique UNIVERSAL LABORATORY FILTER with all necessary features the scientists desire. 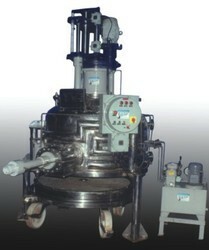 The filter is suitable for handling batch containing 2 to 5 liters of solids/wetcake. 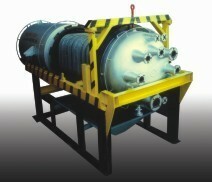 The filtration can be carried out using vacuum and or pressure. Nitrogen purging is also possible. Wetcake washing and drying under Nitrogen can be done. BASP Crystal Processor is particularly designed for Mixing - Reacting, Separating - Filtering, Washing- Extracting, Steaming, Drying, Discharging, Dissolving-Cleaning, Crystalline Solids under Pressure and or Vacuum and hence BASP calls it "Crystal Processor". The BASP Crystal Processor is ideally suitable for Replacing Centrifuges. The BASP Retractable Shell Filter has quick opening closer. Filter leaves are vertically mounted on filtrate header, which is attached to statonary vessel cover.The BASP design has typical shell retracting mechanism for wet cake dislodging and thorough manual cleaning. The jacket can heat or cool the slurry. BASP Reractable Shell Filter is ideal for Edible Fats & Oils, Lubricating Additives, Metal Hydroxide Powders, Minerals (Sulphur), Organic & Inorganic Chemicals, etc. BASP Liquid Purificaton System is most flexible and meets exacting purity demands. The system consists of Prefilter-BASP Spiral Filter, Micro Filter Cartridge Filter & Bacteria/Pyrogen Filter Membrane Guard Filter. All in one. 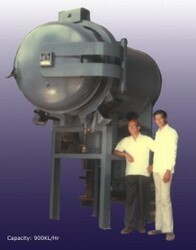 BASP Spiral Filter has been very popular in Europe since 1950. Basp learnt Filtration lessons by fabricating this filter for M/s. Sandoz (I.) Ltd., way back in 1973. Spiral Filter is an ideal replacement for Sparkler Filter. BASP Spiral Filter is most simple, inexpensive but excellent clarifier. Filter element has Spiral shape, wrapped with cloth hence it‘s name Spiral Filter. It has greatest filtering area with with extreamely high surface to volume ratio. The varieties of filter cloths are readily available hence we have incorporated Spiral filter as Prefilter to remove large quantity of suspended particles (10 micron & larger). Micro filter is most common Cartridge Filter. Internationaly varieties of Cartridges are available in various materials and micron ratings dawn to 1 micron.We select & use most appropriate filter element. Guard filter ensures ultimate purity. Membrane Cartridges are available down to 0.1 Micron absolute. BASP selects & uses most appropriate Membrane filter elements, be it electronic grade-non conductive water or Bacteria or Pyrogen free FDA requirement. 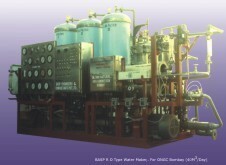 BASP Liquid Purificaton System is engineered & custom built with best quality components and accessories.